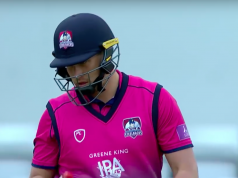 When Olly Stone suffered a bizarre injury last season, he thought it might have ended not just his hopes of a move from Northants to Warwickshire but possibly his whole career. Now, 11 months later, he is hopeful that recovery is not too far away. It was while celebrating the dismissal of Moeen Ali in a T20 game that Olly somehow managed to damage his anterior cruciate ligaments as well as his cartilage. An operation, followed by a long recovery period, beckoned. Hopefully, Olly is now back on track for a return later this season though the possibility remains that 2018 may be more realistic. Still only 23, Olly has the prospect of a long career ahead of him and is enjoying being at Edgbaston. “It’s a Test Match ground so the facilities are great – a bigger dressing room and a gym next door. It’s also a great opportunity to tap into all the experience here. That’s not to say that the decision to move from Northants was easy. Beyond that, he would love, of course, to play for England in any format. How does his approach vary from one format to another? His bowling is not all that Olly has to offer. It’s not just Warwickshire supporters who will be hoping that Olly Stone makes a complete recovery. No-one likes to see a career interrupted or, worse still, prematurely ended by injury. So cricket lovers generally will no doubt wish Olly well as he seeks to complete his long journey back to fitness.